The grand daughter of Cosmopolitan: Veneriete Silver Cosmo! Veneriete Silver Elsa 6 VG-85-NL VG-87-MS 2y. Vekis Veneriete Elsa Queen-ET GP-NL VG-86-MS 3yr. Veneriete Niagra Ida 31 VG-87-NL 2yr. Veneriete Ida 22 VG-87-NL VG-88-MS 2yr. Twister Ida 18 RC VG-87-NL 2yr. Veneriete F CI Prudence 3 VG-88-NL VG-89-MS 2yr. #1 PTAT 1stClass in Europe / UDC +3.27!! Dam to the #2 GLPI Observer in the BREED!! 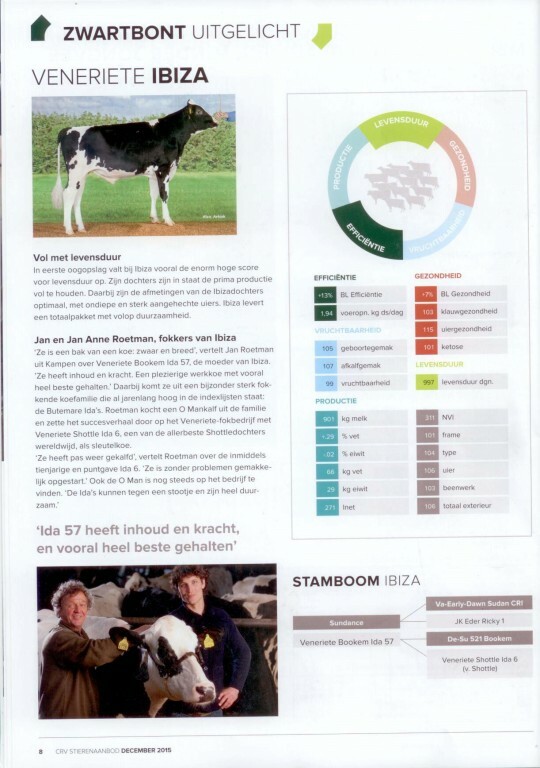 Veneriete Holsteins - Kampereiland, NL- Veneriete Holsteins is established in the east of the Netherlands, only 10 km from Zwolle (OV) 2 of our main cow families are The Sherese family American cow family from origing which goes back on Etazon Hyde. Here the family developed to a great family with successful sires like Willis, Delta Stilist and Stefan. In our herd still very popular and successful bull dams from this family. The Ida's A family which is currently most in spotlights. Goes back on two of the former #1 Index cows from the Netherlands, Butemare Ida Ronald and Butemare Ida Jabot. 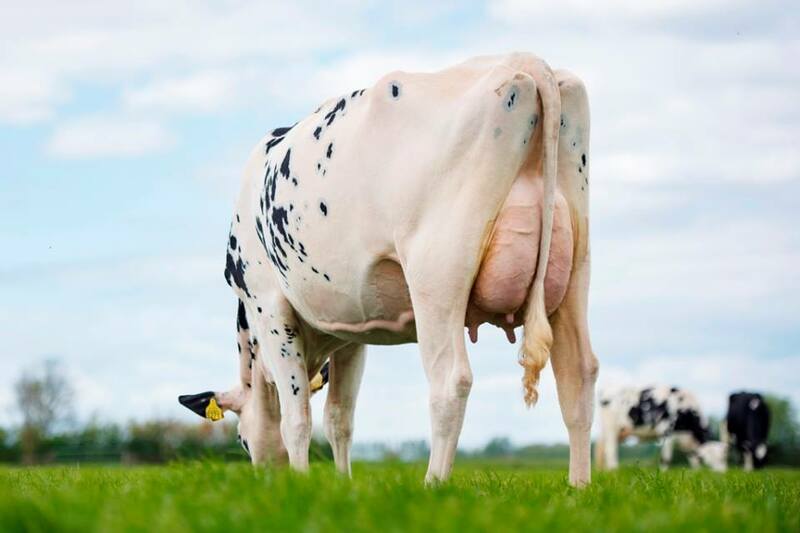 Our branch of the family gave some global success with Butemare Ida 6 VG-86 2yr. 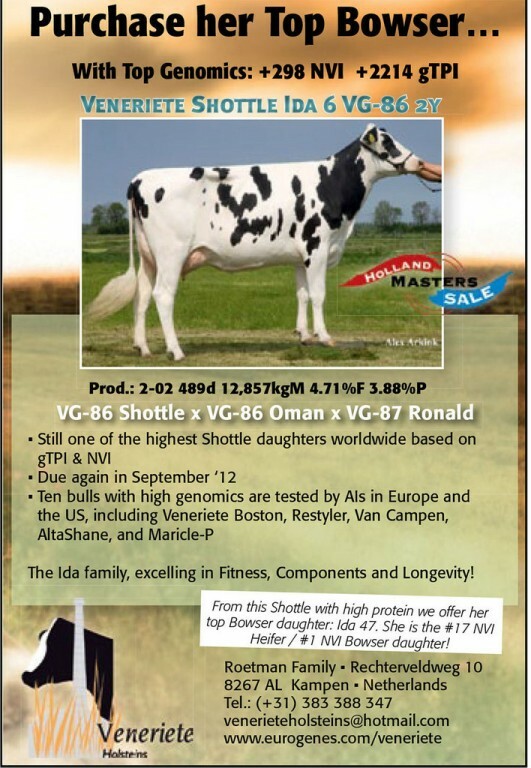 (Shottle x Oman), currently the #2 Genomic index cow in Europe for GTPI and Net Merit. Also other great cow families in the herd.